← Are you solving problems or creating new ones? In the first article in this series, I defined leadership development from the Your Talent Advantage (YTA) perspective. We describe six distinct leadership profiles in YTA, but believe that the unique leadership aspects of each profile notwithstanding, all six are developed to their highest level of effectiveness by growing five skills that are common to all leaders. Leaders build on their natural strengths. They learn to accept/own their natural limitations and develop techniques to mitigate them. This and the subsequent four articles will focus on these skills, and how each is developed, one by one. The core belief of Perceptual Style Theory (PST) is that everyone has the innate capacity to lead, but that the skills associated with that innate capacity vary depending upon which of the six Leadership Strengths Profiles (LSP) an individual has. Before a person can begin to grow and develop their innate leadership capacity into actual, usable leadership skills they must recognize, understand, and claim their LSP. What determines a person’s LSP is their Perceptual Style (PS). PS describes the way in which they perceive the world around them; therefore, understanding one’s unique PS is the first critical step to becoming a leader. Another way to state this is that in order to be an effective leader it is important that there is comfort and acceptance of one’s unique strengths as well as comfort and acceptance of one’s blind spots and short comings. Both sides of this equation can be challenging. Too many times, would be leaders focus their leadership growth and development efforts on strengths in areas that are outside their innate skill set. It is our experience that many people are unaware of and discount what they do naturally well. Rather than focusing on discovering and working on developing their natural strengths to their fullest expression, they spend precious time focused on trying to acquire skills that are not an innate part of the way they see the world. Working on one’s weaknesses or those skills that are missing from one’s skill set is a common approach to personal growth and its goal is a “well rounded” individual or, in this case, leader. Unfortunately, the end result of this approach is mediocre rather than outstanding leadership. It is impossible for any individual to master all six different LSPs, and, in fact, it is truly only possible to master the specific LSP that each person already has as an integral part of whom they are. The LSP program takes a strengths based development approach with an emphasis on getting better at those leadership skills that are innate to the individual. Those who wish to lead; indeed, anyone who wants to perform at their highest level of effectiveness needs to begin their development time on learning how to do more of what they do best and delegating the rest to others for whom the skill is an innate skill. In order to accomplish this first step of leadership development and master the skill of building on one’s natural leadership strengths, it is necessary to know what those strengths are. The challenge to strengths discovery is that people find it easier to identify what they don’t do well than to recognize and claim their natural strengths. 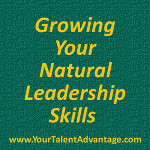 Simply asking, “What are your natural leadership strengths?” is not an effective method. While there are multiple ways to discovery one’s natural leadership strengths and blind spots, most require more effort and time than most people are willing to invest. The LSP program provides a quick and easy assessment that identifies the user’s LSP, describes the profile experience, lists behavioral leadership skills, identifies optimal leadership situations and leadership challenges, and describes ways to mitigate leadership weaknesses. The concise summary delivered by the LSP assessment results provides a solid base from which to begin the crucial first step to developing one’s leadership strengths to their maximum level of effectiveness. This entry was posted in Development, Leadership, Natural Skills, Perceptual Style, Perceptual Style Theory and tagged Building on Strengths, Discovering Leadership Strengths, Leadership Development, Natural Strengths, perceptual style. Bookmark the permalink.